1966 established Brazilian rock or Jovem Guarda as it was known then, as the supreme trend in the country. 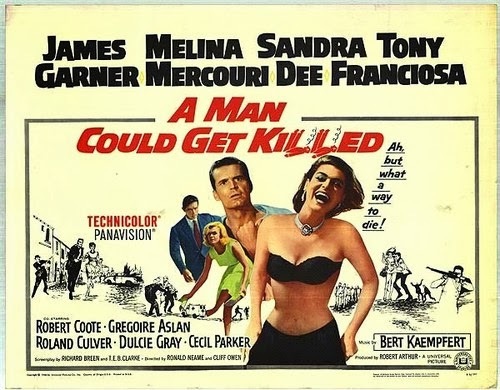 Foreign hits, especially Anglo-American were becoming more & more popular in a trend that would see its peak in the 1970s. 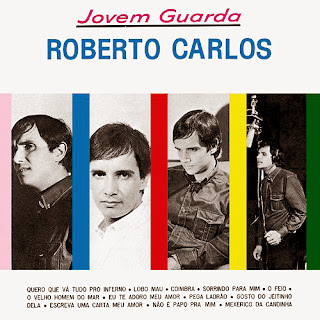 Roughly speaking we could say one-third of the 1966's best selling records belonged to Brazilian rock (Jovem Guarda), another third were foreign hits and the last third was comprised of MPB (acronym for Brazilian Popular Music which means samba and its many variations) and Brazilian 'easy-listening' which later in the 1990s was given a proper noun: brega! 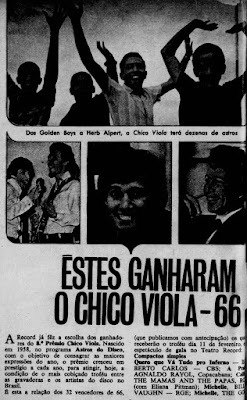 A 100% of those Brazilian acts who received 1966's Chico Violas were under contract with TV Record, the same TV station that issued the Awards. This did not mean there was 'tampering' or any shadowy business. It only meant that TV Record was supreme in the music business. The other TV networks were better in their own fields like TV Excelsior excelled in the drama department and TV Tupi was best in sports. 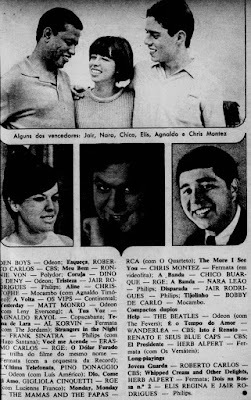 Jovem Guarda's troika Roberto Carlos, Erasmo Carlos & Wanderléa had the best year of their lives. Roberto's 'Quero que vá tudo p'ro inferno' (I want all to go to hell) was a forceful tune where he rhymed winter (inverno) with hell (inferno) and went all the way to #1. 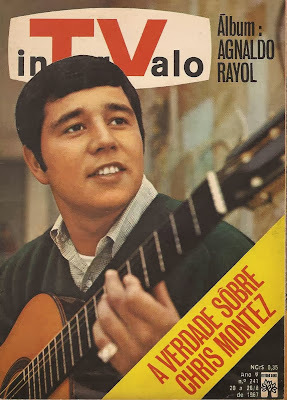 He also hit with 'Esqueça' a cover of Bobby Rydell's 'Forget him', on top of his album 'Jovem Guarda' that would sell throughtout the whole year until he had a new one near Christmas. 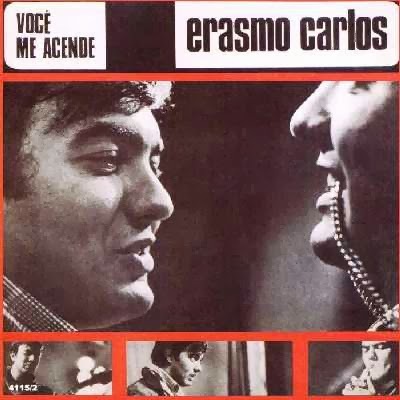 Erasmo Carlos translated Ian Whitcomb's 'You turn me on' as 'Você me acende' and had a lot of radio air play. 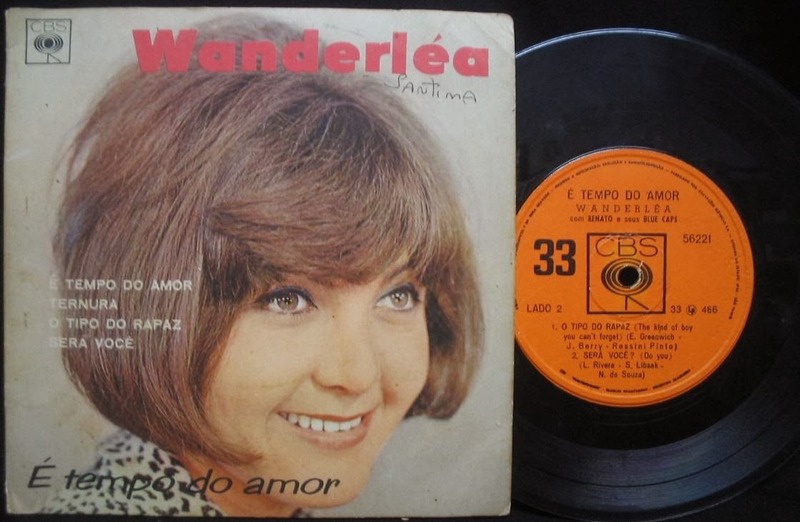 Wanderlea received a Chico Viola for her EP 'É tempo do amor' which includes 'Ternura' (Somehow it got to be tomorrow today) that turned out the biggest hit of her career. 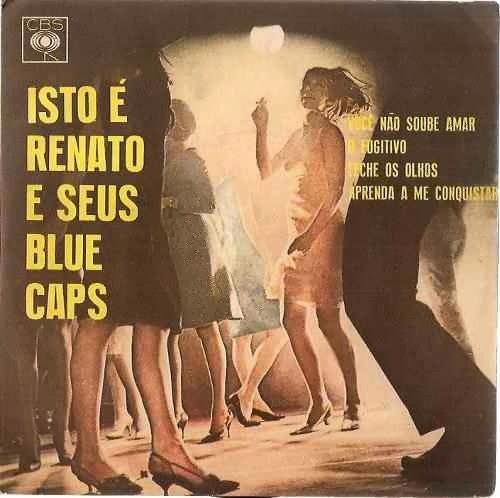 Renato & Seus Blue Caps, a rock band from Rio de Janeiro who accompanied both Roberto Carlos and Wanderlea in their recordings at CBS sold a lot of EPs and LPs. Renato covered many Beatles songs; 'Feche os olhos' (All my loving) was one of their biggest hit ever. 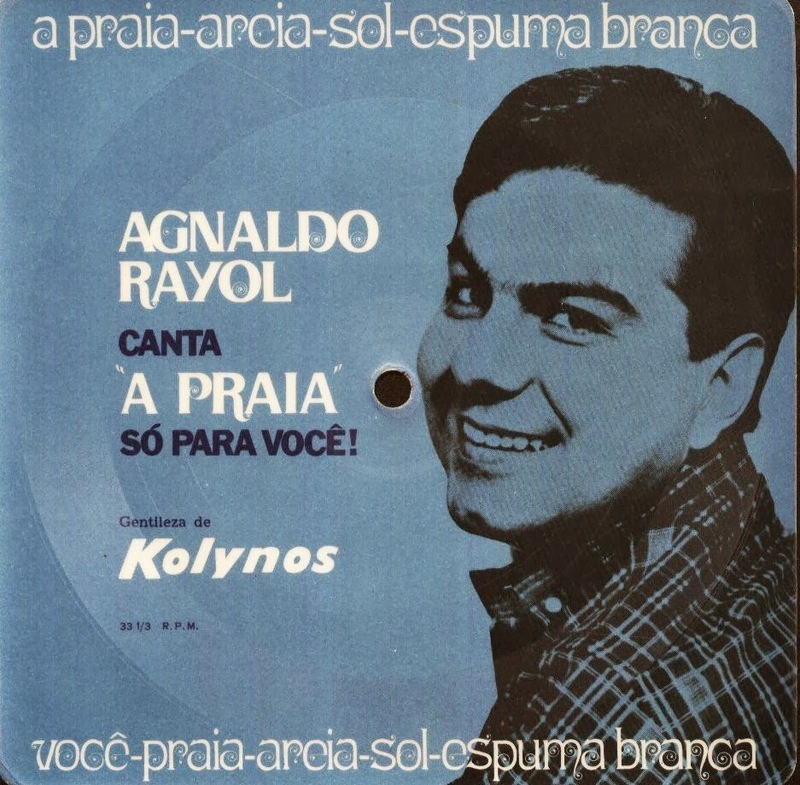 Agnaldo Rayol was a best selling act by anyone's standard. He had a long career with ups and downs but since late 1963 he had been in the charts frequently. 1966 was his best year ever mainly due to his top-ratings TV show on Friday nights. 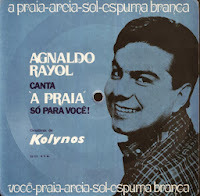 'A praia' (La playa) was perhaps one of his best ever recording; an agreeable ballad where Rayol could show off alll his vocal potential and still be melodious. 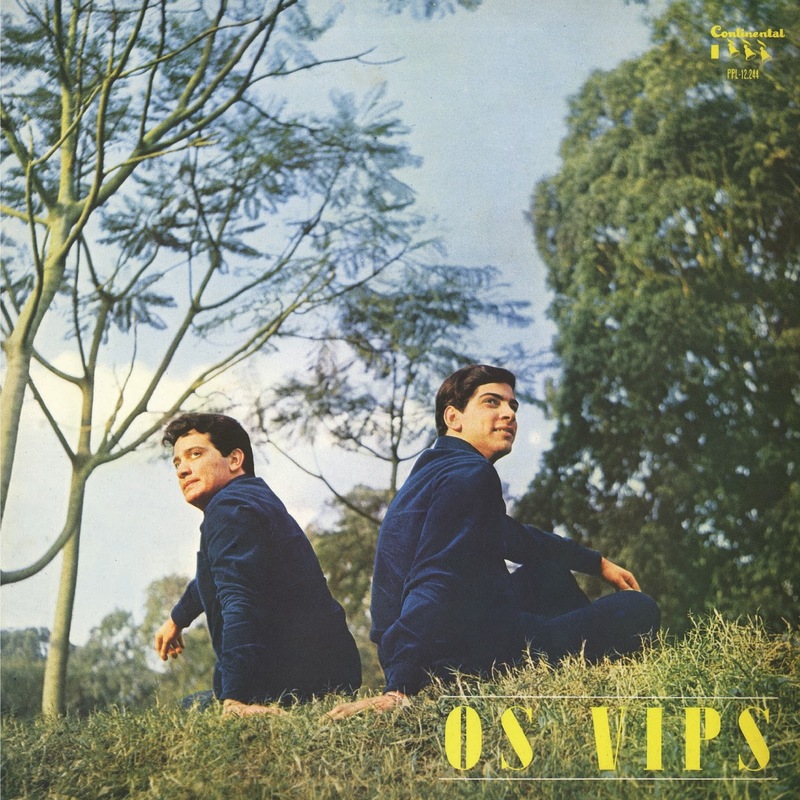 'A praia' went to #1 and 'A tua voz' (Plus je t'entends) getting high up in the charts too. 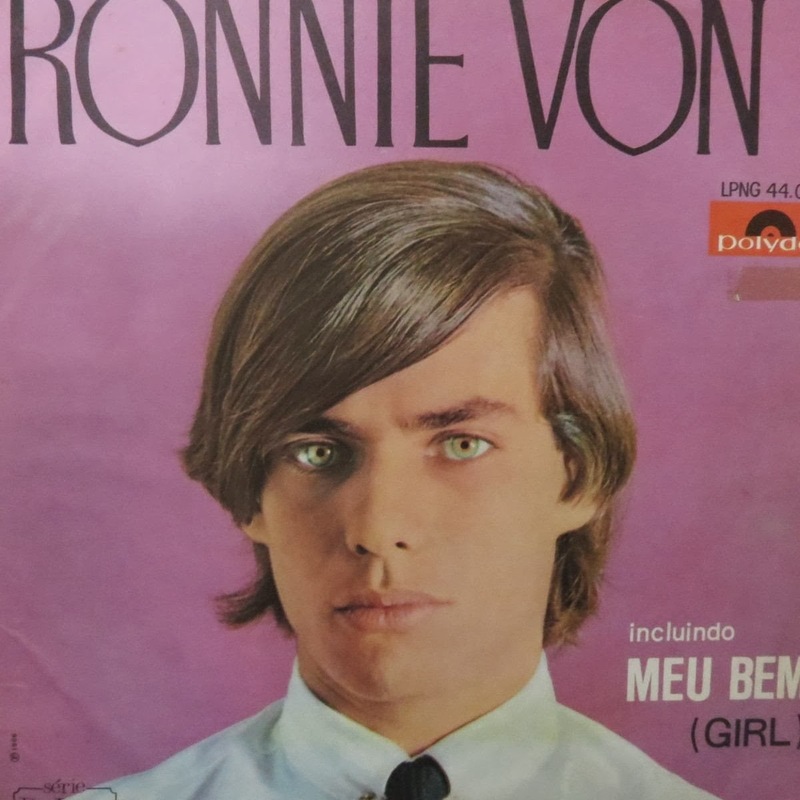 New-comer Ronnie Von (Ronaldo Nogueira was his real name) recorded 'Meu bem', a cover of The Beatles' 'Girl' and went to #1. 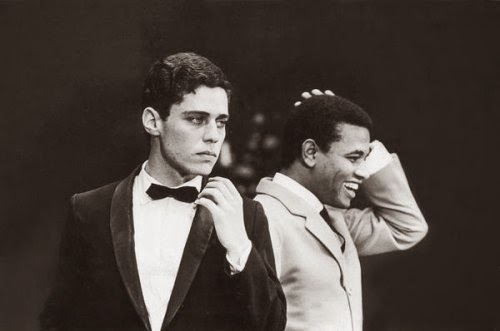 Ronnie was a good looking young man from Rio who had long straight hair that would cover half his face before he gave it a pull with a well-rehearsed movement of his head. 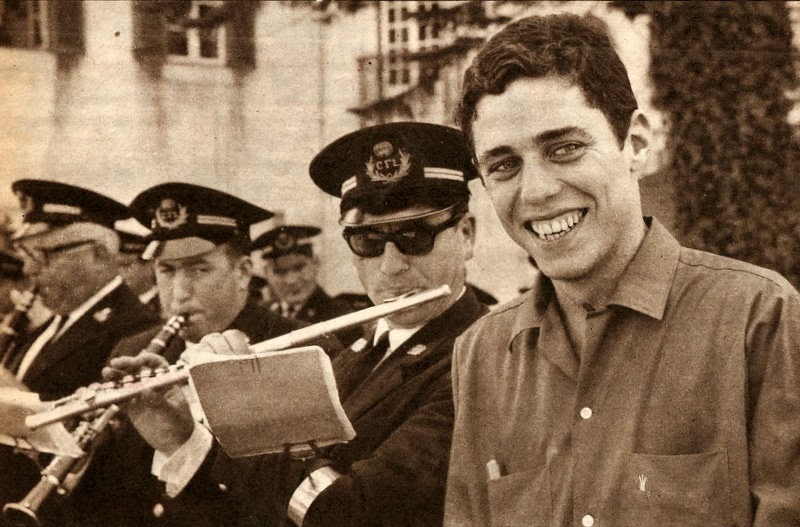 Ronnie was the new darling of Brazilian rock. 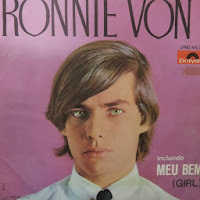 TV Record had to use him somehow so they gave him a TV show of his own on Saturdays called 'The little world of Ronnie Von' where he would sing and introduce modern rock bands that didn't actually fit in with Roberto Carlos' more popular show on Sunday afternoons. Ronnie Von and Renato & Seus Blue Caps were not the only acts to cover a Beatles song. Vocal group The Golden Boys also hit the charts with 'Michelle' sung in Portuguese. 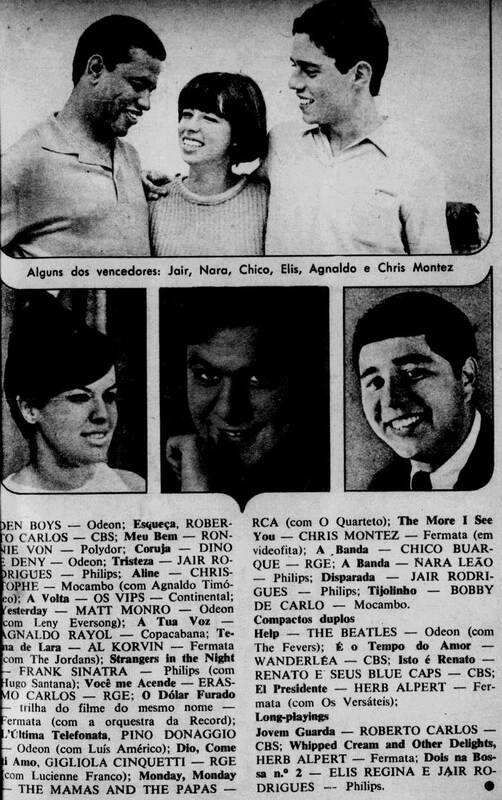 They came from a very musical Rio de Janeiro family which had already spawned Trio Esperança (see 1963). Actually The Golden Boys started in the early 1960s but only came to national prominence in 1966. 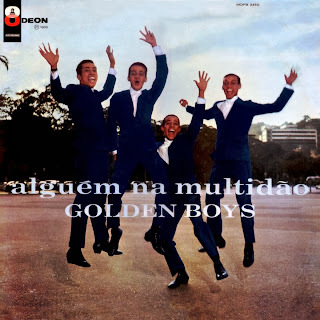 The Golden Boys in an ealier time: from left to right: Ronaldo, Renato, Waldir (cousin) and Roberto - 3 brothers and cousin Waldir. 'Michelle' also hit the charts with Billy Vaughn and his Orchestra. 'Yesterday' was a hit by British act Matt Monro who had had hits in 1964 ('From Russia with love') and 1965 ('Walk away'). There were two rock duos in 1966. Os Vips were brothers Ronaldo Luiz Antonucci (born 17 AUG 1941) and Marcio Augusto Antonucci (23 NOV 1945) who repeated their 1965 feat ('Emoção') and took 'A volta', another Roberto Carlos-Erasmo Carlos tune to the top of the charts. The second duo was Deny & Dino who topped the charts with 'Coruja' (The owl) released by Odeon. They hailed from Santos-SP. 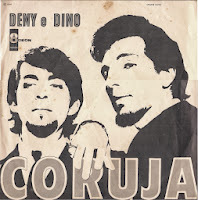 Deny was José Rodrigues da Silva (born 25 APR 1941) and Dino was Decio Scarpelli (9 MAR 1944). Both spotted goatees which was unusual then. With 12 foreign acts among the winners of Chico Viola Awards - a third of the list - it had become a logistic conundrum for the organizers of the ceremony to solve. 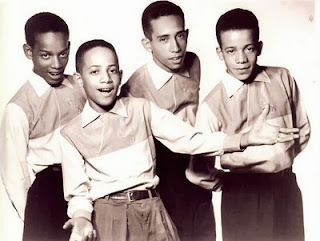 So they decided prominent national acts - who had not received any trophy in 1966 - would perform the foreign hits. 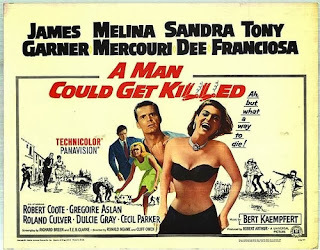 As TV Record had a huge roster of acts of all persuasions it was an easy task. Rock duo Leno & Lilian sang 'Yesterday' in lieu of Matt Monro; Eliana Pittman performed Mamas & Papas' 'California dreamin' and O Quarteto sang 'Monday, Monday'. Rock group The Jordans who had a small brass section which they would soon enlarged trying to immitate Herb Alpert's combo performed 'Lara's Theme' in lieu of pistonist Al Korvin. Luiz Américo that later in 1973 would become popular as a samba act sang Pino Donaggio's 'L'ultima telefonata' in Italian. Lucienne Franco also sang 'Dio, come ti amo' in Italian. 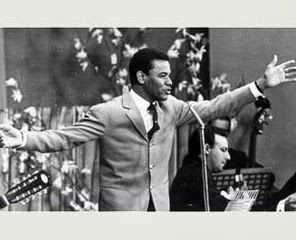 DJ and TV personality Hugo Santana sang 'Strangers in the night' for Frank Sinatra. Hugo Santana would soon leave Brazil and start a new career as a TV personality in Puerto Rico. TV Record's own Orchestra conducted by Cyro Pereira did their own rendition of 'Se tu non fossi bella come sei'. 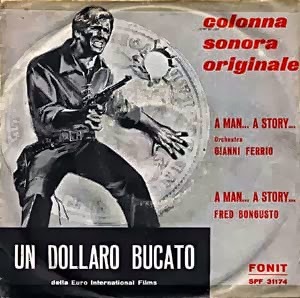 Italian music popularity reached its peak in 1964, and now it was on the wane with only 3 hits: Gigliola Cinquetti's 'Dio, come ti amo', Pino Donaggio's 'L'ultima telefonata' and the orchestral rendition of the main theme of spaghetti-western 'Un dollaro bucato' (Dolar furado) which was really popular. Dolores Erickson poses for the cover of 'Whipped cream & other delights'. According to Esquire magazine: 'We bought this album for the album cover. For here is what lust looked like in 1966. Today it looks like just a lot of cholesterol. In fact, the stuff wasn't whipped cream, it was shaving cream. And the model, her name was Dolores Erickson was 3 months pregnant when the picture was taken'. 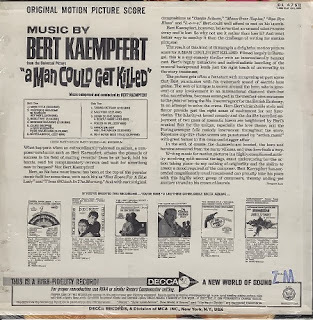 Herb Alpert's Tijuana Brass received 2 trophies: one for the EP 'El Presidente' and the second for the album 'Whipped cream and other delights'. Herb Alpert turned out to be a main trend-setter among Brazilian musicians on both sides of the samba-rock divide. Chris Montez's rendition of 'The more I see you', a 1945 tune written by Harry Warren with words by Mack Gordon especially arranged by Herb Alpert was huge hit and would be emulated and copied by many Brazilian acts like Erasmo Carlos ('O caderninho'), Os Incríveis ('Molambo'), The Jordans, Wilson Simonal, A Turma da Pilantragem and many others for a couple of years coming. 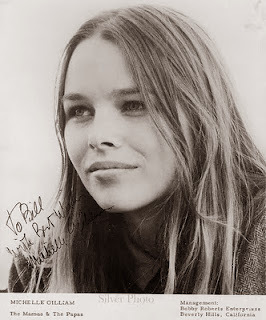 Michelle Gilliam was the beautiful face in The Mamas & The Papas. She also helped hubby John Phillips write some of their most famous material like 'California dreamin' and 'Got a feeling'. Clockwise from top-left: John Phillips, Denny Doherty, Michelle Gilliam and Cass Elliott aka Mama Cass was a great sensation as The Mamas and The Papas, sweeping the charts with 'California dreamin' and 'Monday, Monday', selling a lot of albums and extended-plays too. 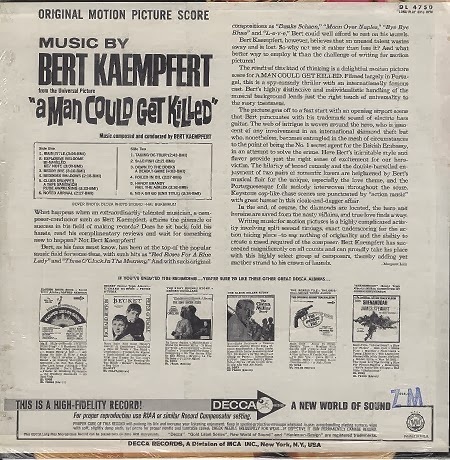 Bert Kaempfert wrote 'A man could get killed' sound-track. Frank Sinatra decided to get words to one of the themes and release it as a single: 'Strangers in the night' went to #1 everywhere.